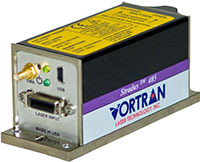 The Stradus® Violet (405nm and 420nm) and UV (375nm and 395nm) modules are all direct diode, TEM00 lasers that offer the highest possible optical power and lowest noise available today. The violet and ultra-violet lasers benefit greatly from the patented sealed optics module that ensures long term power stability and longer life diode operation. The short term power stability is enhanced through the use of the external photo-detector – which is also protected from the outside environment by being inside the sealed optical module. The long term power stability is enhanced through the use of the sealed optics module – ensuring that any contaminants that are generated from the electronics do not affect the optics. Life test data (data available upon request) on Stradus® lasers confirm over 50,000 hours of operation. The user, through the use of any PC, can interface to the Stradus® laser through the user interface software that is supplied with each standard Stradus® Laser. The user interface allows for easy and efficient control of all laser functions as well as an effective monitoring display of key laser parameters (e.g., laser power, diode current, diode and base plate temperature).